Crape myrtle's are easy to grow and a delight to anyone's garden. This Semi-dwarf shrub with peppermint blossoms is extremely showy from mid-summer through fall. Plant in groupings for the best affect or line a drive or fence. Also great for cut flower arrangements. Crape myrtle are the most colorful element of Southern gardens from mid- to late summer when each branch and twig on the plants is tipped with a 6- to 12-inch cluster of white, pink, red, lavender or purple-red flowers. Individual flowers are about 1 1/2 inches across, so crinkly they look as if they were made of crepe paper. Crape myrtle leaves are oval and 1 to 2 inches long; they are bronze-colored when they first unfold in the spring and become yellow, orange or red before falling late in autumn. The smooth gray bark of old branches and stems gradually flakes off to reveal fresh pinkish bark beneath. 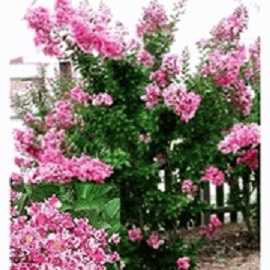 Crape myrtle's grow in Zones 6-10 and do best in full sun and in moist soil that has been well supplemented with peat moss, leaf mold or decayed sawdust. For hedges, plant crape myrtle's about 4 or 5 feet apart. Apply a high nitrogen lawn-type fertilizer in early spring and again in late spring. Crape myrtle's bloom on their new growth, so promote it with nitrogen. Do not fertilize after late summer, so they can go completely dormant before winter. Please note depending on how you select shipping your order will arrive within 1-10 days. Soak overnight before planting. In general, these items can be planted anytime your ground is not frozen. An early snow or frost will not harm a nursery stock item that is already dormant. On the other hand, these items can also be planted during warm weather--simply be sure to water well.